Democrats and Republicans have reached an agreement that would fund the federal government for the remainder of the 2011 fiscal year, averting a shutdown … for now. 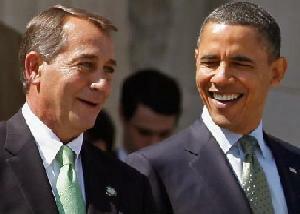 Hours before the midnight deadline, House Speaker John A. Boehner (pictured above with Pres. Obama) emerged from a meeting with his Republican caucus to announce the agreement, saying he had secured the best deal possible from Democrats and the White House. Lawmakers in each chamber must still vote on the final agreement. As part of the deal, lawmakers will hold separate votes on funding for Planned Parenthood and the implementation of President Obama’s healthcare plan. I know that it might not matter to some of y’all, but most of us got screwed anyway. “Change you can believe in”. Y’all heard the Tea Party’s reaction to Boehner’s striking a deal with Obama and the Democrats? They going to primary him. This should be a reminder to anyone who has any illusions about the reason for the formation of the tea party movement. The Tea Party was formed as a reaction to America having a black president. Their single minded purpose is to ensure that Obama does not continue as president. And they are virulently opposed to any measures taken by Republicans which does not aid in that purpose. Virginian pilot .com news paper..Mock slave auction done with kids in school. go to drudgereport.com to read the article..